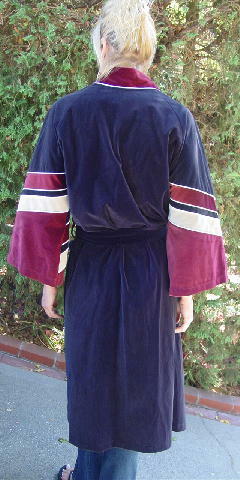 This vintage 85% arnel triacetate and 15% polyester (velour) robe is a Christian Dior Monsieur. 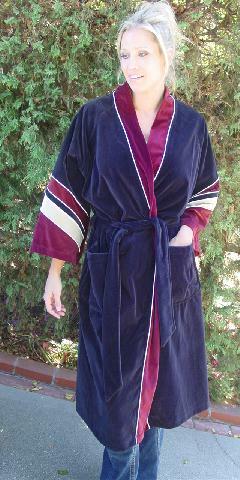 It's in black, light burgundy, and sand with accent cording in bright white. It has raglan sleeves, two deep front pockets, two belt loops on each side, and a 2 1/8" wide by 75" long fabric matching belt. It was worn by an actor in a movie and a female model in a photo shoot. neckline to end of sleeve 24 1/2"